Growing older is natural, but eating the right foods can slow the process down and keep your body's stores of age-fighting nutrients topped up. 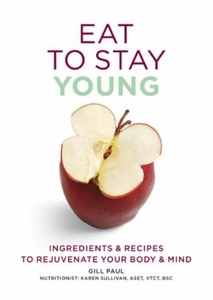 Featured in this book are the key foods that have been proven to increase the feeling of youthfulness in our minds and bodies - cranberries, aubergines, guava, tuna and cinnamon to name a few. A clever problem-solver helps you choose the ingredients that address your symptoms, whether thinning hair, dry skin, poor circulation, joint pain or forgetfulness. With over 60 easy-to-follow, quick-to-prepare, completely delicious recipes and weekly meal planners, Eat To Stay Young is the perfect way to turn back the clock and achieve optimum health.